Space travelers may opt to take all the food that they will need with them. This option assures that food shortages will not occur, provided the mission stays on schedule and that there are no accidents which might render some of the stored food unusable (or unreachable). This is becoming a less viable option for long-term space travel for a number of reasons. Astronauts on the ISS really appreciate fresh food supplies when they arrive; although the prepared foods are adequate from a nutritional perspective, the psychological aspects are also an important consideration. The cost of preparing and transporting food for a 23 – 27 months mission (to Mars) may be excessive. Although taking all the food may be an option for one-time visits to the Moon (or even Mars), the long-term consequences for habitation on these bodies are not appealing without the provision of a fresh food option. Space travelers may opt to take only some of the food that they will need with them, and then grow the additional food that they will require throughout the remainder of the mission. Plants and their seeds can be regenerated, more or less indefinitely, thereby avoiding food shortages. Plants however react in complex, and sometimes unpredictable ways with their environment so their success is not always assured. One danger is that plants can also be destroyed by stowaway microscopic organisms. Recent research suggests that growing crops on the surface of the Moon and, later, developing a greenhouse system on the surface of Mars, may be one of the best options. Some food from plants would be available en route, using plants initially grown on the Moon; food from plants grown on Mars would be available while on the surface of Mars and on the return journey. Clearly, crops which take a very long time to mature will not be useful. The growing time might exceed the duration of the mission, and even if the mission is much longer than the growing time, excessive amounts of stored food will be required to cover the interim period. Since cultivation space will be at a premium, getting the maximum amount of edible crop from every square metre of space will be extremely important. Since the crop will be a source of food energy, it will be important to get as much energy as possible from every kilogram of grown food. Crop yields are taken from UNESCO Crop Yield Data Averages for Europe 1990-2000. The best crop to grow is one which has small hardy seeds, a short germination period, a low light compensation point (grows well in reduced light), is easily pollinated, and has a high yield of food energy per square metre of cultivated area. Ideally the crop should grow well in a wide variety of soil types and have modest requirements for water. Tomatoes seem to fulfill these requirements. If you must grow food in a limited space, the chart above helps you decide what you should grow. 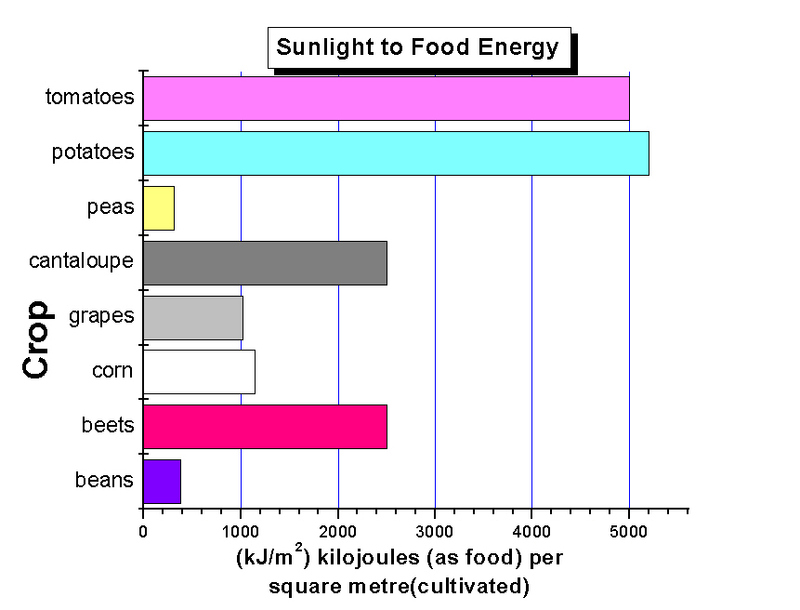 The graph tells how much food energy (in kilojoules) you can expect to harvest from each square metre of planted crop. Notice that potatoes and tomatoes are the best, by quite a large margin. However, due to the nature of growing potatoes, and the fact that potatoes can be stored and processed in a variety of formats, potatoes are probably not high on the list of candidate crops. Interestingly enough, potatoes were featured in the recent book called The Martian by Andy Weir; this gained much public interest when the book was turned into a movie starring Matt Damon (2015).